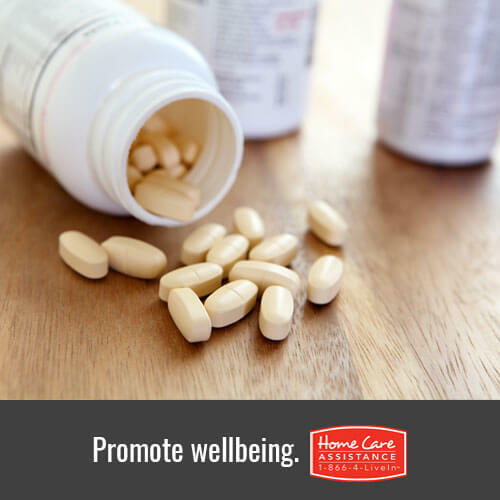 Your senior loved one may require certain medications to keep his or her health in tiptop shape. Though intake of more than one type of medication is normal for this age group, the side effects and risks of each medication should always be taken into consideration, as there is always the possibility of a sensitive reaction. Here are a few side effects presented by Home Care Assistance of Rhode Island to watch for if your elderly relative is taking any of these commonly prescribed medications. Often prescribed for seniors with respiratory problems such as bronchitis or emphysema, this medication has a few side effects such as shortness of breath, bladder pain, tightness in the chest, and difficult urination. Metformin is used to treat diabetes. Some of its side effects can include decreased appetite, diarrhea, discomfort, and nausea. This medication treats heart conditions and high blood pressure. Blurred vision, confusion, dizziness, and unusual weakness are all possible side effects of this drug. Namenda is often prescribed to seniors in advanced stages of Alzheimer’s, but is not recommended for those who have a history of seizures, urine disorders, or liver problems. Common side effects include headaches, rapid weight gain, nervousness, and bloating. Though Fosamax can be effective in treating osteoporosis and Paget’s disease, it has a few potential side effects to watch for, such as ulcers, anemia, joint and muscle pain, and irregular heartbeat. This stomach acid-reducing drug not only treats gastroesophageal reflux disease, but is also known for the ironic side effect of stomach pain. Other risks include fever, sore throat, loss of appetite, and unusual bleeding or bruising. Apresoline lowers blood pressure and is known for its fast-acting results, though it is only prescribed in the most extreme circumstances. Side effects to watch for are nausea, shortness of breath, chest pain, and irregular heartbeat. These are only a few of the multitude of medications a senior may be prescribed to battle their health issues. If used as instructed, the risks should be minimal. Family members or live-in caregivers should always consult with a doctor and pharmacist to ensure a loved one isn’t taking medications that might react with one another. To learn more about senior health and wellness, reach out to Rhode Island Home Care Assistance. We’re the leading provider of Parkinson’s, stroke, Alzheimer’s, and dementia care Rhode Island families trust. Our caregivers are experienced and expertly trained, we offer 24/7 availability, and our care services are backed by our 100% satisfaction guarantee. For more information, call (401) 284-0979 and schedule a complimentary in-home consultation.